Explanation: Craters produced by ancient impacts on the airless Moon have long been a familiar sight. But only since 1999 have observers seen elusive optical flashes on the lunar surface - likely explosions resulting from impacting meteoroids. These startling observations were made with modest telescopes and video equipment during the 1999 and 2001 Leonid meteor showers. Six confirmed flashes, some initially as bright as a third magnitude star, were all seen within hours of the peak of the 1999 shower. At least two more lunar flashes, the brightest one at about fourth magnitude, have been confirmed during this November's Leonid storm. 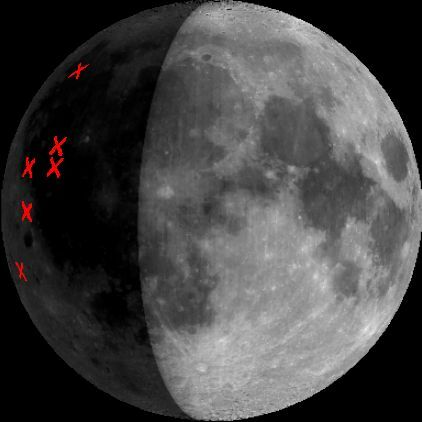 The 1999 locations are indicated by the red Xs on the dark lunar night side in this projection of the Moon from November 18 of that year. Similar flashes would have been difficult to see if viewed against the Moon's brightly lit portion. It is estimated that the flashes were made by meteoroids with masses in the range of 1 to 10 kilograms, producing craters a few meters across.